A few people were asking about having a section for anxiety so I decided to revamp the whole ELSA assessments and split it into sections. You can use all of it but also you could only use the bits that you deem to be relevant. I haven’t posted images of all of them but you can download the zipped pack from here: ELSA ASSESSMENT 2017**Please note this needs opening on a computer or laptop. A person or persons who know the child the best should fill in these forms, NOT the ELSA, unless of course you know them better than anyone else and perhaps work in class with them. It is really important to speak to parents too because sometimes behaviours from home may be interfering with the child at school or there maybe some background information that needs adding to the forms. This may inform your planning. 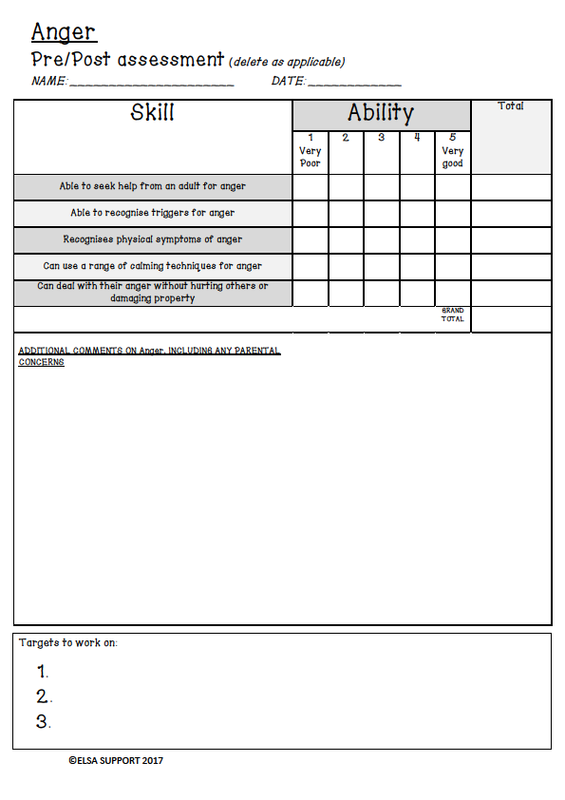 I have added 3 targets to the bottom of each sheet. This will help you decide on what you are going to do with them. You can’t tackle everything at once so do it in stages. Remember there are loads of resources on this website both free and paid (very low cost) which can help you to focus on what the child needs support with. For example if a child is struggling with growth mindset and behaviour for learning then have a look at the MINDSET PLANNING. If a child is struggling with friendships then look at the FRIENDSHIP PLANNING. 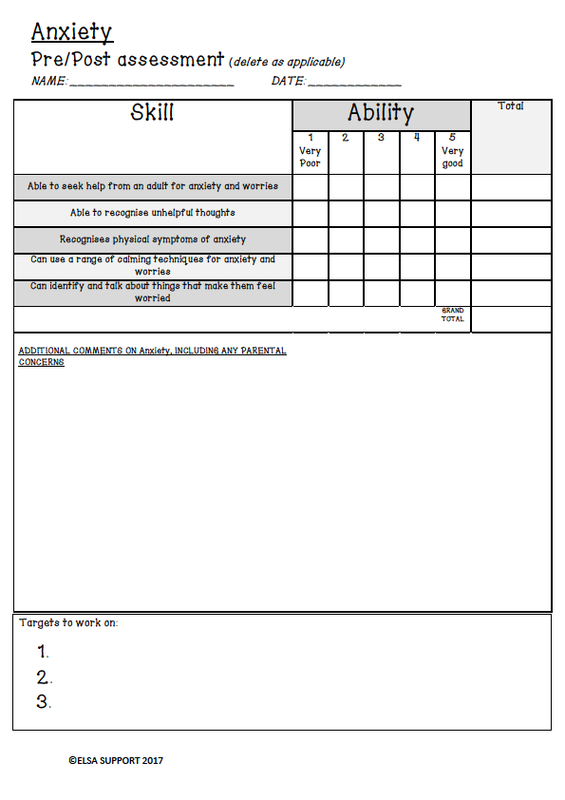 If a child has self-esteem problems then try the SELF-ESTEEM LAPBOOK or if they have problems with anxiety then try the WORRIES AND FEARS LAPBOOK or the ANXIETY INTERVENTION. Emotional awareness can be worked on with many resources on the website. Some examples are MINDMONSTERS or EMOTIONS EARLY YEARS. A child with anger issues could be taught one to one with the ANGER LAPBOOK. Please do look around the site there are literally hundreds of resources that might be helpful. A school has asked me for an editable version but unfortunately I cannot do this. I could tailor it to your school, add your logo if you do so wish. The copyright notice must stay on the sheets though. There would be a small charge of £5 payable by paypal for my time and use of the resource under your school name. These are just brilliant. My ELSA’s and I use so many of your resources, this site is a godsend. Just concerned as I didn’t seem to be asked for payment for the assessment sheets. They are free Nicola 🙂 and thank you for your lovely comments. These are amazing, thank you so much for doing all the work. They are so clear and concise. Great resource, thanks so much! Thank you Debbie for the resource. I find the assessment of ELSA children the hardest part of the job, but this will help a lot. Thank you this is exactly what I was looking for! Would you be able to send a pack to me even if we are not ELSA registered? Dear Debbie. 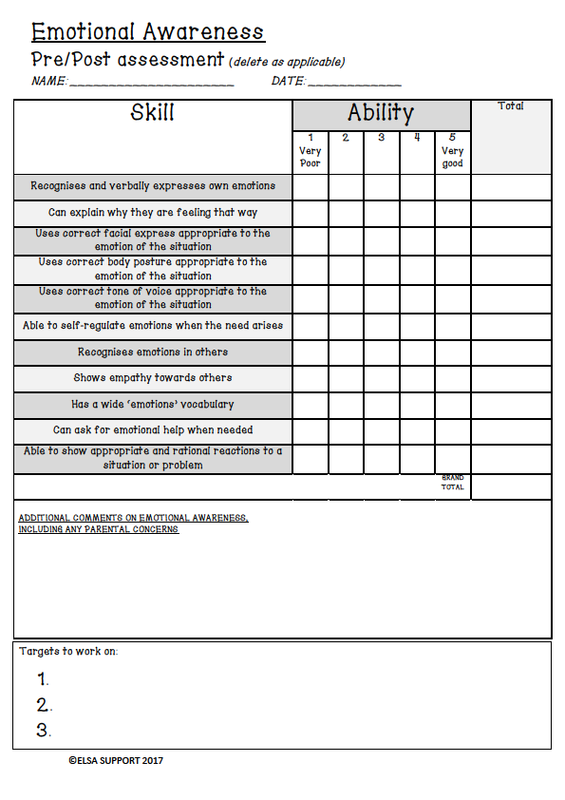 Am making use of your brill assessment sheets with a few to using the excel version. Just a query about why there is a total column at the end.The teachers have just ticked the column either 1 to 5. Have I missed something? Hi Julie, I assume you are talking about the paper assessments not the EXCEL version. The total is at the end of the column so that you can easily add up the score for each section. It just helps to give you that total score or grand total. Hi just a quick question can i get the pupils to do the same assessment as the teachers to compare? You can use them in any way you choose really. There is a pupil version that is more child friendly to be honest and that might give you the information you need. That said, you could try putting the questions into ‘child speak’ to ensure understanding. Can I just ask whether you would give all of these forms to the teacher? It seems like a lot to fill out and I’m not sure if my teachers would be too happy with me if I gave them all of these. I really like how it is broken down though, so it would be useful. Yes give them all to the teacher and let them decide which ones to fill in. They can do them all or just an area they are concerned about. The excel version is probably better and less time consuming.